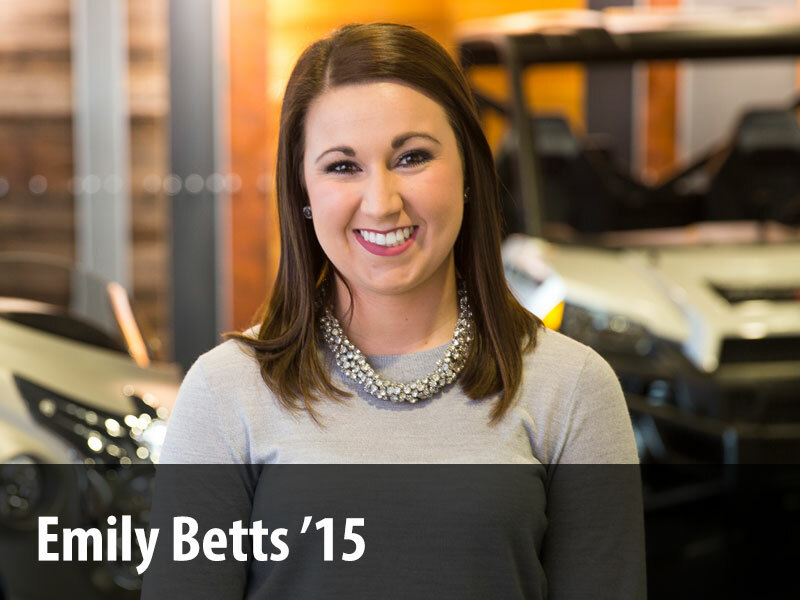 Backing up data on a regular basis is the responsibility of every employee. With advances in technology and reduced cost in storage media, the process has become easier and faster than ever before. ITS recommends that you backup your computer at least once every month. Backing up data to an online file storage service, CD-RWs, or other media on a PC is covered in this ITS training documentation. The primary reason for backing up your data is that failures happen. To be ready for computer failures, we want you to backup your data. A backup procedure is easiest to carry out if all the files that need to be copied are in one upper-level folder instead of scattered here and there. That folder is simply copied to a CD-RW or a network drive. When a big computer problem occurs, you may get a new computer, or your old one may be taken away to be “reformatted.” Either way, you will get back a computer with program files on it and your data files will be restored either from the old hard drive or from your backup. It is recommended that you store confidential information on your home network share or Google Drive rather than on your computer. You may store all of your data on the network where it is backed up daily for you by a nightly schedule and where it cannot be lost if your computer crashes or is stolen. There are many network shares available, depending upon who else you want able to see the documents. For more information on network shares, read the article XP Network Shares or Vista Network Shares. Any data that is on your computer should be placed in the “Documents” folder on your computer’s hard drive and the “Documents” folder should be backed up on a regular basis. 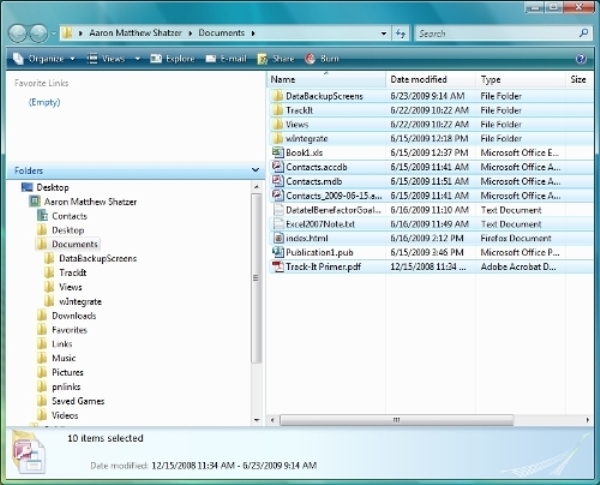 Some files are not stored under “Documents”, such as Firefox bookmarks, Internet Explorer (IE) favorites, Start Menu shortcuts, and any files/folders/shortcuts saved on the desktop to name a few. If you store some of your files on an online file storage service such as Google Drive or Dropbox, those files are automatically backed up for you on secure servers. Often, changes made to files can be undone, and files can even be undeleted. Additionally, files stored on these services can be accessed from any computer connected to the Internet, and it’s easy to share files with anyone who needs them. The CD-RW drive in your computer is advantageous because it can be saved to, or “burned” multiple times when using a CD-RW CD. That means that you can modify files already on the CD and add new files at a later date. Note: Burning to a CD-R CD is permanent and cannot be rewritten. 1. Exit all running programs. Files that are currently in use cannot be backed up. To prevent messages regarding in use files from appearing during the backup, close all programs before beginning the backup. 2. Insert the CD-RW into the CD drive. 3. 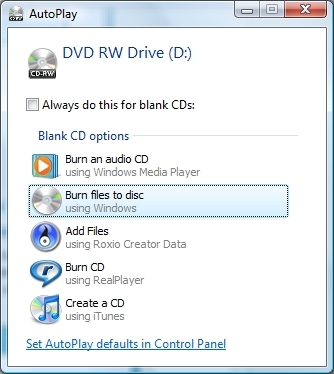 When the Autoplay: DVD RW Drive (D:) window appears, select the option labeled Burn Files to Disc using Windows. Click OK.
4. 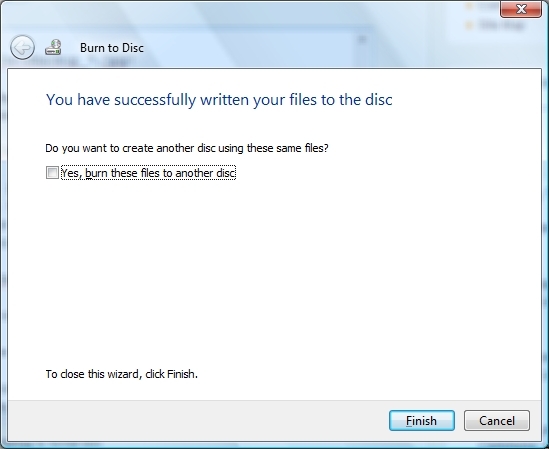 The Burn a Disc window should appear. Enter a title for your backup disc (The default, which is the current date, is fine), then click the Show formatting options arrow. 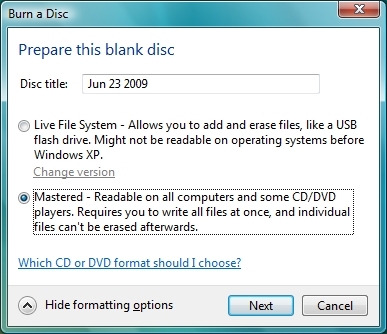 To make sure that your disc will be accessible from most computers, select the Mastered option, then click Next. 6. Select the files you would like to back up. You can select all the files via Organize > Select All or use the Ctrl + A shortcut, then hold down Ctrl and click to deselect files. Alternatively, you can just hold down Ctrl and click to select individual files. 7. Copy your selected files. Click Copy under the Organize menu, or use the Ctrl + C shortcut. 8. Verify the files will fit on the CD-RW. a. Select Organize > Properties. b. 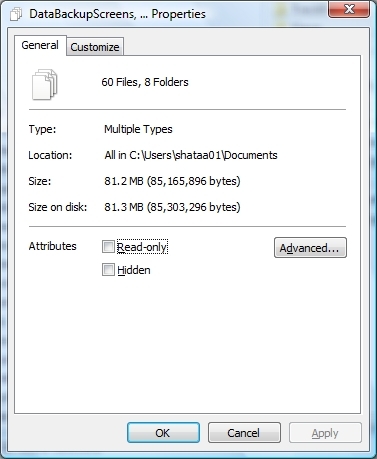 The Size on Disk item displays the amount of space required for the entire set of selected files. c. Most CD-RW’s can hold 600+MB of data. If the “Size” displayed is greater than the storage capacity of your CD-RW, either remove some of the files from the selection, or choose a different medium for the backup. See the section titled “Become Aware of Other Backup Media” for more information. 9. Select the “DVD RW Drive (D:)” window again. 10. Paste the selected files by clicking Organize > Paste. Notice that as the files are pasted into this folder, the top of the listing reads “Files Ready to Be Written to the Disc”. 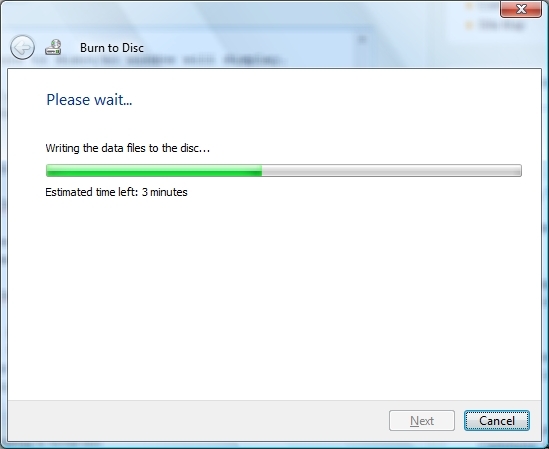 In addition, a window will display showing the progress of the copy and the length of time remaining for the process. 11. Select Burn to disc which is located at the top of the window. 12. 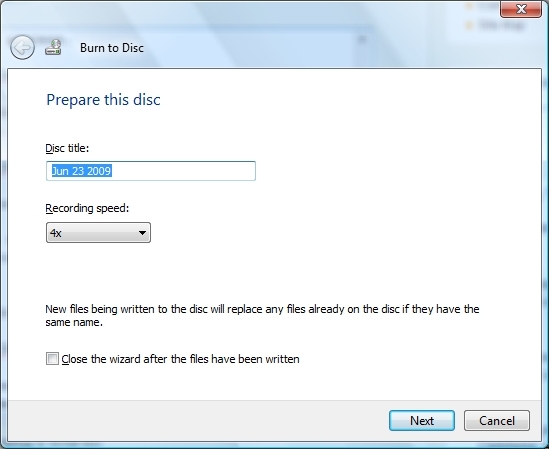 The Burn to disc window will display. a. Enter a name for the CD. Using the default which is the current date is fine. Leave the recording speed at “4x”. c. A progress bar will display along with the estimated time remaining. d. When it has finished copying the files, a window will display with the message You have successfully written your files to the CD. and the CD drive will open. Click Finish. e. Remove the CD and store it in a safe location. You can restore one or more files from a backup. The following steps walk you through the process of restoring a file. If you are not sure how to find your file or are uncomfortable with this process, contact the Technology Help Desk. 1. Insert the CD-RW into the CD drive. 2. 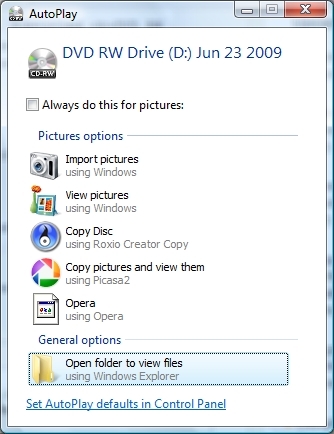 When the Autoplay window, subtitled DVD RW Drive (D:) appears, Select the option labeled Open folder to view files using Windows Explorer. 3. Select the file(s) to restore, using the methods in the above section. 5 Copy the selected file(s) by clicking Organize > Copy. 6. Navigate to the location in which to place the file. 7. Paste the selected file(s) by clicking Organize > Paste. If the CD-RW is to be a backup, you may not want to save changes directly on the CD-RW. Change your files in their primary location and save copies of them on the CD-RW when desired. Files on the CD-RW may be sorted in different ways for display. When clicking on the Name column, for example, the groupings are labeled with the letters of the alphabet. There are several different types of media that may be used for backing up your data. Listed below are some of them. In general, the process for saving to them and restoring from them is the same as described above for writing to a CD-RW. If you would like assistance in using any of the following, please contact the Technology Help Desk. Multi-session CD-Rs. A multi-session CD-R format allows you to burn to the same CD more than once. This can save you discs over time. For information on multi-session CD-R burning, contact the Technology Help Desk. CD-RWs, CD-Rs, and DVDs scratch very easily. Handle them carefully, only touching the outside rim. If they become scratched, use new media. 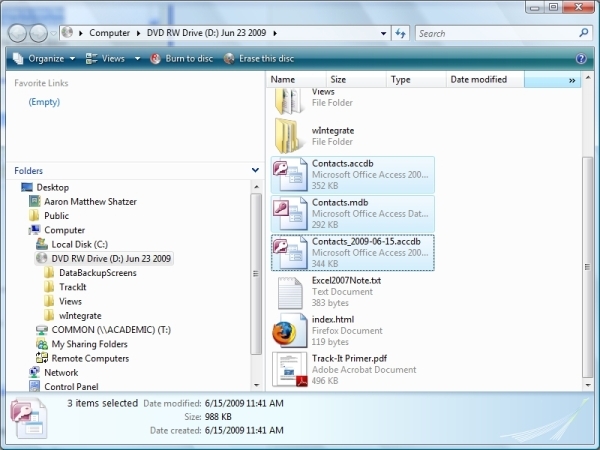 Windows XP does not support copying to a DVD, so you have to use DVD authoring software. Faculty and staff computers have Sonic RecordNow! software installed and the following link includes step by step instructions for creating a data DVD. If the CD Drive window does not display automatically when you insert the CD, try again and wait for it to open without using other programs while waiting.